Belinal® superior contains polyphenols from silver fir branches that act as a strong antioxidant and have many positive effects on the immune system and the body in general, as demonstrated by research and clinical trials at the Faculty of Pharmacy. Vitamin C from acerola contributes to the normal function of the immune system, plays a role in protecting cells from oxidative stress or from cell damage and contributes to the reduction of tiredness and fatigue. Belinal® superior is characterized by a rapid and efficient absorbtion. Belinal® is a Slovenian and completely natural substance, which is a mixture of oligo and polyphenols, and is scientifically researched and analyzed at the Faculty of Pharmacy, University of Ljubljana. The highest quality of branches are manually collected from ecological prehistoric forests of Kočevje. For the production of the active ingredient Belinal® additional cutting of silver fir is not necessary, since the quantity of raw material is large enough from the regular harvest. In the process of the industrial extraction only clean water is applied, without the use of harmful solvents or alcohol. During the research of of silver fir branches, scientists have discovered more diverse range of polyphenols than in the bark. So far, they have identified 36 different polyphenols, which all operate synergically. In particular, the more low-molecular polyphenol having numerous positive effects on the body. Dominated by phenolic acids, lignans and flavonoids, which run strong antioxidant activity, individual groups of them act as anti-inflammatory and others as inhibitory effects on the digestive enzymes. Belinal® superior also contains vitamin C, which is a plant origin and has a role in the functioning of the immune system, role in protecting cells from oxidative stress and contributes to the reduction of tiredness and fatigue. Belinal® superior is a mixture of natural polyphenols and vitamin C, and one of the most powerful antioxidants, measured in real terms in a living cell. It enters in the body as an antioxidant in the process of establishing oxidative balance. Most of the active ingredient of the mixture is rapidly absorbed into the body, the speed was increased with the additional catalyst for absorption, so you Belinal® superior is detected in the blood within 30 minutes after ingestion. Healthy person should take 1-2 tablets a day in terms of preventive usage. The best results are achieved when taking the first tablet between 6am and 8am on empty stomach. The second tablet should be taken before or soon after mentally or physically efforts during the day. Since it's an extremely powerful antioxidant with no side effects and without the possibility of an overdose, it is appropriate to be consumed between 6am and 6pm, so the own immune system can be regenerated by itself overnight. It's also recommended to take the daily need of water (1.5 liters in small doses). In case the daily exposure to physical efforts or viral disease is increased, then 1 tablet every two hours is recommended to be consumed. in case of post-surgical conditions, if symptoms of the viral infection are already present, during regeneration phases between treatments with chemotherapy drugs. It's not allowed taking Belinal superior in period of two days before and two days after treatment with chemotherapy drugs due to extremely effective antioxidant activity which could completely neutralize the activity of chemotherapy drugs. In these cases it's recommended at least 3x two tablets Belinal® superior daily (2 tablets at 6 am, 2 tablets at 12pm and 2 tablets at 6pm). Treatment could be accelerated up to 5x two tablets daily (2 tablets at 6am, 2 tablets at 9am, 2 tablets at 12pm, 2 tablets at 3pm, 2 tablets at 6 pm). Duration of the therapy should be supervised by the doctor as well as therapy prescription (dose and frequency of daily usage) based on the patient's medical condition. Belinal® extract from silver fir branches (Abies alba Mill. ), 150.0 mg, bulking agent: microcrystalline cellulose 104.4 mg Anti-caking agent: calcium phosphate monobasic 80.0 mg, 60 mg acerola extract, silicon dioxide 4 , 0 mg magnesium stearate 1.6 mg carrier and promoter of absorption: chitosan and mortar dextrin. Sweeteners, lactose, yeast extract, gluten, artificial colors, preservatives and are suitable for vegetarians. Store in a cool dry place at a temperature below 25 degrees C.
For children under 3 years of age, pregnant women and nursing mothers you must consult with your doctor or pharmacist before taking Belinal® superior. In the case of prescripted medication send us by e-mail info@alpepharma.si and let us know what medicines you take and when. Our doctor or pharmacist will be writing you a messages or restrictions if exist. Analysis of the quality of ingredients in the product are permanently checked on the Faculty of Pharmacy, University of Ljubljana. Since the active ingredient of the Belinal® superior is quickly absorbed in the body, you'ill get the first effect already after 30 minutes. Some feel this as energizing and more energy immediately and feel better, better concentration while enjoying the late evening hours. It is possible prolonged wakefulness. Long-term effects of the operation are visible after 2 or 3 months consumption. The majority of users feel well-being, more energy, few colds and illnesses, easier to transfer stress, greater endurance, and recovery after sport activity, more concetrated, more youthful skin. Due to improved micro-circulation, free radicals are less harmful, according to regular customers you get enhanced immune system response. 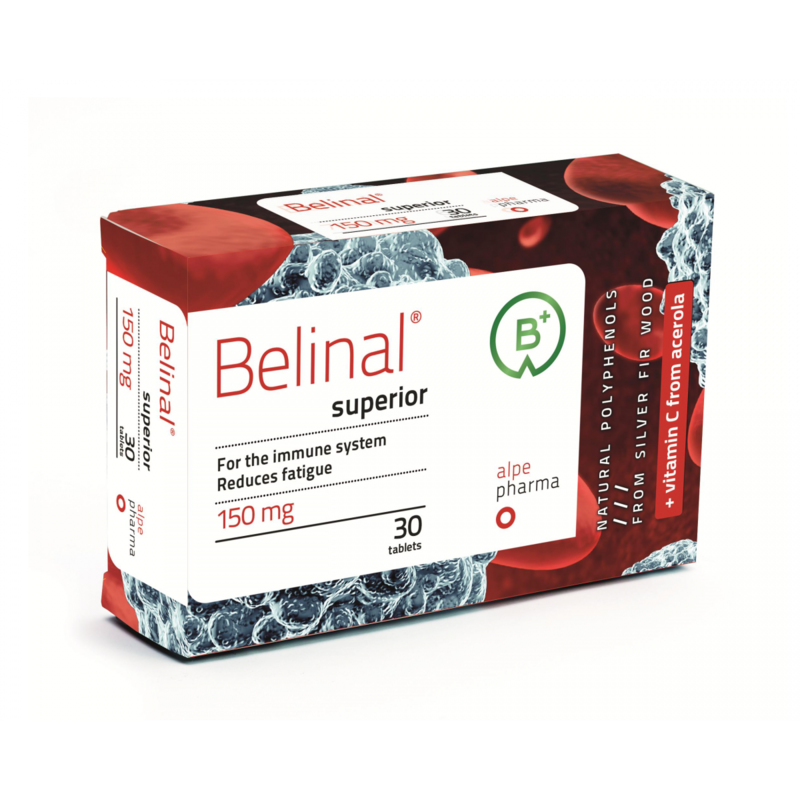 Many of the users of the Belinal® superior effects describes very simply: "I feel ten years younger!" The preventive purpose and for the purpose of enabling the general functioning of the organism, the recommended usage is one 150 mg pill daily. The dose may be taken before or during a meal. It is recommended to regular, at least quarterly consumption. Since Belinal® superior does not have side effects, it can be consumpted for an unlimited period of time and thereby we can permanently care for our well-being. Belinal® superior is completely safe, organic, natural dietary supplement. Only demineralised water is applied for the extraction, without the use of chemical solvents. The highest quality branches of silver fir are manually collected from European prehistoric forest, where no pesticides and heavy metals are found. Throughout the complete process and packaging is carefully controlled in order that each series of extract is analysed in laboratories. Of course. Body requires daily take of vitamins and minerals. Belinal® superior works synergically with vitamins and minerals. Enjoy a healthy and natural diet along with Belinal® superior and you will feel a significant improvement in well-being. For the reason of health, please contact us at info@alpepharma.si and our doctor or pharmacist will answer your question. Because of the potential for interactions with other drugs that are otherwise unlikely to occur, in accordance with general practice, we recommend that Belinal® superior eat one hour after the administered medicine or one hour before the ingested drug. I am very glad that your product, Belinal® superior, exists because it makes my days better, gives me new energy and a sense of calm. Let me introduce myself. I am 62 and I recently retired. My mothered suffered a stroke last year. Everything changed and my sister and I started taking care of her. There are many obligations and I started to feel the overwhelming stress of the burden. As I was reading the Planica supplement in March 2015, I read about your dietary supplement with the Belinal extract and vitamin C and I said to myself that I should purchase your product because I felt really tired and exhausted. I bought the product at the Tosama store in BTC and started taking it immediately. WITH CONFIRMED RESULTS – Belinal® superior really helped me, when I was under stress. I started feeling CALM and could easily do my daily chores. THANKS to your “Belinal”.